Recent dramatic advances in our understanding of gratitude have changed the question from "does gratitude work?" to "how do we get more of it?" This book explores evidence-based practices in a compelling and accessible way and provides a step-by-step guide to cultivating gratitude in their lives. Gratitude Works! also shows how religious, philosophical, and spiritual traditions validate the greatest insights of science about gratitude. 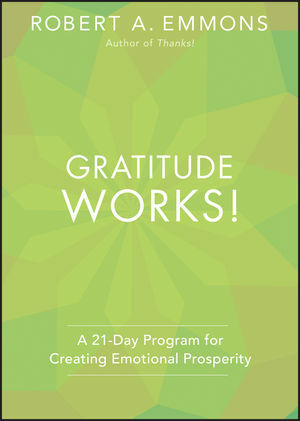 From Robert Emmons, the bestselling author of Thanks, comes a resource for cultivating a life of gratitude practices. Robert A. Emmons, Ph.D., is professor of psychology at the University of California, Davis. He is past president of the American Psychological Association's Division 36, The Psychology of Religion. Emmons is founding editor and editor-in-chief of The Journal of Positive Psychology.